Aaaand the nominees ARE …. David Fallin who will be running for the U.S. House of Representatives in the 7th congressional district around Wilmington and the eastern stretch of I-40 against Republican David Rouzer and Democrat Kyle Horton. According to Guarino, candidates can still file for office with the Constitution Party through the end of June — IF they want to be on the November ballot. My first thoughts? I think it is smart that the party is starting small. Get some people elected locally. Then try to move up the political food chain. Some of these candidates look a little quixotic. Some of the races could be interesting. In Greene County, an incumbent county commissioner named Jerry Jones will be running in November under the Constitution Party ballot. Take Tony Keech in the Beaufort County sheriff’s race. According to media reports, Keech was separated from the sheriff’s department in 2011. County officials came after him with lawyers to collect an alleged debt to the tune of $5,300 and change. Keech’s alleged debt? $150. Kevin Hayes is running against our *favorite* MEAN OLD MAN Jimmy Dixon in NC House District 4. He was an unsuccessful Libertarian candidate against Dixon in 2012. Greg Holt is a disenchanted former Republican seeking a Craven County board of commissioners seat. He lost in the Republican primary in May. Craven County has a conservative streak that could offer some surprises in November. Sharon Hudson, another friend of The Haymaker, is running for NC Senate District 4’s seat currently held by Jeff Tarte. She ran unsuccessfully in 2014 as a Republican for Thom Tillis’s old House seat. Hudson is the former VP of the North Mecklenburg Republican Women and the co-chairman of the Tea Party group Lake Norman Conservatives. She could make things a little more nerve-wracking for Tarte — who was already locked in a tight general race with a Democrat. Tarte has really gotten under the skin of small-government fans in and around his district. Hudson could give those unhappy folks somewhere to park their vote in May. David Fallin, running against congressman David Rouzer, lost a Pender County commissioner GOP primary race by THIRTY votes in May. He will be on the ballot in November for the 7th congressional district’s general election. ← NCGOP’s Nix: We are NOT the “conservative” party! The State Board of Elections is making these folks drive to Raleigh to file. It might be useful to know more about Mr. Keech’s side of the story with respect to the issues discussed in this post. The Beaufort Observer article describes a highly unusual set of circumstances with the county ultimately settling the case. All this does is solidifies Democrat victory in November. Shame on you for even promoting this. The Green Party is also on the ballot taking votes away from the Democrats. The Republicans are, for the most part, worthless these days. It is now a center-left party. If you’re a regular visitor here for the last several years, you would know that Conservatives tried every possible approach to reform only to be stymied by the Chamber of Commerce stooges who run the NCGOP. Those who have hijacked the Party for their own selfish ends left conservatives no other choice. And frankly, you can thank the NCGOP House and Senate caucuses for promoting this, it was their doing, after all. Everyone to the right of center in NC needs to learn the Wild Rose lesson on third parties. As in the Wild Rose Party of the Canadian province of Alberta, named after the provincial flower. The Progressive Conservative Party had long dominated Alberta politics, but it had become too progressive and insufficiently conservative, so breakaway conservatives founded the Wild Rose Party to its right. It was slow going in its first elections, but it finally gained the traction to start winning legislative seats. In Alberta’s most recent provincial election, Wild Rose won more legislative seats than the Progressive Conservatives. The problem was, that by dividing the center-right vote between the parties allowed the socialist New Democrats to win an overall legislative majority for the first time ever. Fortunately, people in both parties recognized the problem and they have recently merged under the name Conservative Party (no “progressive” in the name any more), adopting a platform that was essentially that of the Wild Rose Party and choosing as a leader someone from the right wing of the old Progressive Conservatives who was respected by both parties. At the merger, not only did the Wild Rose Party have more legislators but it also had considerably more paid memberships from individuals than the Progressive Conservatives. A handful of progressive legislators left to become independents, but the bulk of the party is now united to take on the left in the next provincial election. North Carolina does not need to get to that point. We need to put forward solid conservatives now to lead our party structure and to lead our legislative caucuses. To help consolidate our party as conservative, we need to close our primaries so that liberals do not meddle in them. Is what happened in Canada what NC will have to go through to reign in the majority liberal Republicans in the state? If the Democrats are already in power, this journey may make more sense than when we’re the majority party. Or maybe not. The issue is liberal Republicans (or just Republicans) running the party. I’m not convinced that the Constitution Party with its 283 Twitter followers is the answer, and I’m as pissed off as most of you are. Does anyone know why the Constitution Party didn’t call itself the Conservative Party, since we’re hyperventilating over party names? Is the name already in use by another group? Would the Conservative Party name not be accurate? The Constitution Party is different than the GOP on several levels. It is more committed to liberty-related approaches in a broad sense; it is more committed to the social issues that concern social conservatives; it is less enthusiastic about foreign interventionism and war; and it is more committed to state sovereignty (i.e., federalism) and also national sovereignty. it is less enthusiastic about trade deals and various international agreements that mingle us with other countries. It is more committed to secure borders. Functionally, the GOP is much different than the Constitution Party. The fact is that the vast majority of Republican elected officials have not embraced this kind of agenda. The Constitution Party is more comparable to the liberty-infused Tea Parties– not the GOP itself. And calling us Conservative would be a misnomer, because we are much more committed to the Constitution itself than the vast majority of Republican “conservatives”. 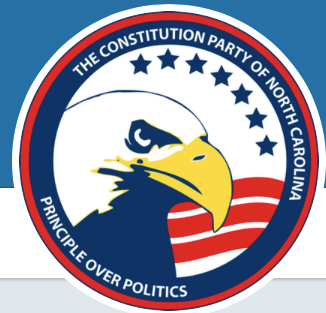 Since the Vice-Chairwoman of the NC GOP herself publicly declared that the NC Republican Party was not a conservative party, the obvious need for the Constitution Party was established. I predict that a few of their candidates will do fairly well in 2018 and 2020 could be a breakthrough year for the new party. Time will tell, but this is a growing movement from all that I’m hearing from my Republican friends who are supporting it. Davis said, “Since the Vice-Chairwoman of the NC GOP herself publicly declared that the NC Republican Party was not a conservative party…” That’s not what she said. Her comment was, “News Flash – the name of our Party is the REPUBLICAN Party, not the Conservative Party.” And the Republican Party is NOT the Conservative Party. That’s not hard to understand or complicated. Whether the Republican Party is conservative is a matter for debate. I really lose hope for the conservative movement when we are no better than the liberals making up things instead of reporting the truth and quoting accurately. I can agree with your first sentence if you change it to read, “The Republican Party should always = a conservative party”. The rest of your post attributes intent to her that cannot, without a vivid imagination, be deduced from her comment regarding the NAME of the party. It is interesting that you think conservatives can prevail without Republicans who don’t meet your litmus tests. Unless you win elections, conservatism is just a pipe dream. The platform sets the ideology of the party, and the platform of the NC Republican Party is solidly conservative. The problem is that we have some elected officials, including our legislative leaders, and some party officials who disrespect the platform. That needs to be corrected in primaries and in conventions. We need party officials and elected officials who represent the true views of our party, not self-seeking opportunists. “Philosophical Republicans” speak Republican but do not legislate Republican principles. “Legislative Republicans” speak Republican and legislate Republican principles. Who gets to define “real” and “fake”? Those who follow the platform are real and those who do not are fake.